As President Obama heads into the first of three debates with Mitt Romney nursing a slight lead in the polls, he has a wealth of historic precedent to draw on, and no shortage of advice -- much of it unsolicited -- to guide him. Some 17 must-dos and don't-dos were passed along to RCP by scholars, experts, and political practitioners -- but long before the litany became that extensive, it emerged that one obvious pitfall for presidential candidates is over-analyzing the debates ahead of time. Overthinking is not a candidate’s friend. If Obama -- and Romney, for that matter -- has spent weekends memorizing the U.S. GDP going back a decade, rejiggering the decimal points behind his tax proposals, and rehearsing a folder full of tweet-inducing zingers, he just might miss his mark on Oct. 3. Obama enjoyed a bit of a boost at Romney’s expense after a secretly recorded video of the Republican describing the “47 percent” went viral on the Web. The president has been rated as more likable in polls, he flaunts his gravitas as commander-in-chief, and Americans say he understands the worries of the middle class. If character is the threshold question for the tiny number of people in just a few important states who haven’t made up their minds yet, the president and his supporters believe Obama can make the sale during the debates. “I think what voters are looking for is the sense that ‘this guy knows what he’s doing,’ and ‘I feel comfortable leaving this guy in charge,’ ” said Patti Solis Doyle, who ran Hillary Clinton’s campaign when she debated Obama (and the other Democratic presidential candidates) in 2008, and later helped prepare Joe Biden for his vice presidential debate with Sarah Palin. With recent polls indicating that voters are leaning toward Obama in key swing states, the president hopes the debates can affirm or rekindle comfort with his leadership, policies and overall skills. At the same time, he wants to create doubts about Romney and angst about what might happen if the GOP controls the White House come January. 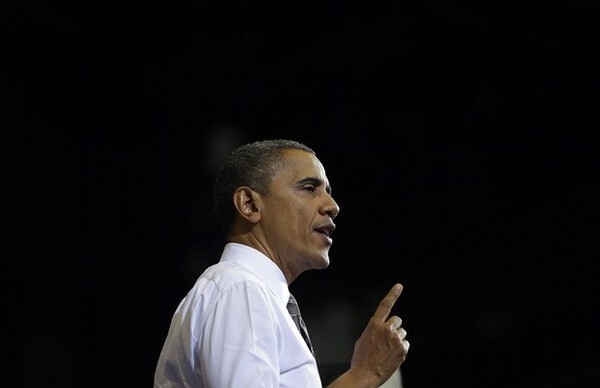 For Obama, winning the debates is about trust, and electoral math. But as recent polls have shown, many voters this year are torn between two candidates they find tough to love. Not since 1992, when voters confronted a three-way presidential contest as the country climbed out of a recession, has there been such a tepid level of satisfaction with the presidential choices, according to a report this week by The Pew Research Center for the People and the Press. Fifty-four percent of voters said they were either very or fairly satisfied with the choice of Obama or Romney, while 40 percent said they are not too or not at all satisfied, according to the national survey. In 2004, 60 percent said they were satisfied with their choices, and by 2008, 72 percent of voters said they were pleased to choose between Obama and John McCain. Campbell warns there is justification for skepticism about the impact of presidential debates on election outcomes, but he wrote that debates can contribute to a “narrowing effect” that can benefit the challenger in the final weeks of a contest. Obama campaign adviser David Axelrod described this phenomenon to James Fallows of The Atlantic earlier this summer. Going into the debates, the front-runner generally faces higher expectations than does the trailing candidate, who manages to score points just by holding his own, Campbell wrote. “If both candidates perform about equally well in a debate and if the debate has any impact at all, it should benefit the trailing candidate and reduce the front-runner’s lead,” he found. This is one of the reasons Obama’s team is trying to lower expectations for the president’s performances while suggesting that Romney will get a bounce. The president’s team says Obama hasn’t debated in four years, has been too busy with his responsibilities to practice enough (Sen. John Kerry of Massachusetts has portrayed Romney), and expects the GOP nominee to go for a knockout. The former governor debated his way through the Republican primaries this year and has practiced for weeks, they add. The president’s advisers have publicly suggested Obama’s Achilles’ heel in any debate is his predilection to state, rather than explain, his views, doing so in windy 15-minute increments after each question. In 2008, Obama’s team worried that he didn’t know as much about policy as did Hillary Clinton, and that voters would struggle to envision Obama as commander-in-chief in comparison with war hero McCain. After four years in the job, Obama’s knowledge of governance exceeds Romney’s but he admits he sometimes struggles to explain how his policies would fit together in a second term. Laying it out in a microburst format, rather than in a 45-minute speech with teleprompters, is not the president’s preferred technique. He can improvise, but sometimes gets into trouble (“the private sector is doing fine,” “you didn’t build that”). And even his fans say Obama can appear bloodless, humorless and thin-skinned. And everyone agrees that atmospherics and body language count during debates. We know debaters should rely on their own makeup artists; leave their wrist watches at home; always emote if their spouses are part of a question; and never whine. Playing the role of the smartest person in the debate doesn’t always work out during a political reality-show that gauges character, confidence and cunning. When Al Gore confided to his debate advisers in 2000 that he planned to stride into George W. Bush’s space on the debate stage in an effort to knock him off stride, he thought he could rattle the Texas governor just as he’d unsettled Ross Perot on CNN’s Larry King show in 1993. No one warned the vice president to stick to his stool. But what harmed Gore more was his elaborate sighing during the first debate, which his team could not hear inside the hall, coupled with his pestering interruptions that stretched the patience of commentators and voters watching on TV. Rudeness was thus seen as part of Gore’s character. The vice president felt strongly that “Bush deserved to be shook up because he was smug and getting away with stupid stuff,” the former adviser said. Gore and his debate team “just assumed Bush would look uncomfortable” as the vice president challenged him head-on. Instead, Bush appeared bemused. If it happened today, Bush’s tight-lipped smile and curt nod at Gore would have ricocheted around the Web in seconds. But in 2000 (and even in 2008), the instant analysis took place when the debates ended. But in a Twitter universe, opinion gels as the combatants are still speaking (or not speaking, as happened during the GOP primaries when Texas Gov. Rick Perry’s memory failed him). Obama’s campaign has encouraged supporters to attend “debate-watch parties,” to be held in homes and bars nationwide. The instant commentary encouraged by social media is intended to shape perceptions while the events are in progress. Supporters can contact friends to get them to watch before the show ends. Plus, media commentary and water-cooler chatter about the most memorable debate moments can be as influential among voters as actually viewing the debates live, the president’s team believes. “It used to be you would wait for the punditry. Now it’s happening concurrently,” Solis Doyle said. TV audiences for the debates have generally been shrinking since 1960, according to Nielsen Media Research data. The networks have tried to adjust the formats, involve the voters in the questioning, and encourage dramatic expectations of two titans teetering on a high wire. Obama and Romney will debate domestic policy at the University of Denver on Wednesday; all topics at Hofstra University, in Hempstead, N.Y., on Oct. 16 in a town-hall format; and at Lynn University in Boca Raton, Fla., on Oct. 22 for a discussion of international policy. Vice President Biden is set to debate Rep. Paul Ryan at Centre College in Danville, Ky., on Oct. 11.